^ 1.0 1.1 1.2 1.3 Mozambique. World Economic Outlook Database. International Monetary Fund (IMF). April 2016 [2016-06-12]. ^ 莫桑比克国家概况. 中华人民共和国外交部. 2017-01 [2017-05-22]. 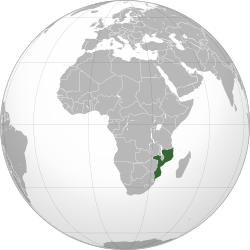 ^ Mozambique has 28.8 mln people: census. Xinhua. 2017-12-30.